Good morning! I hope you're having a wonderful weekend! We are relaxing at home and enjoying the cool (finally) weather! 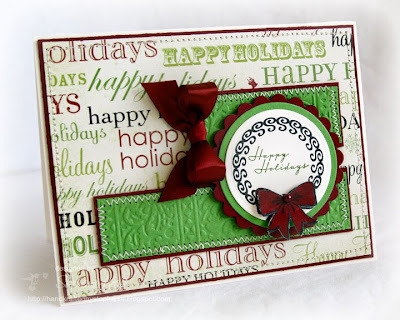 I used Julee's Mojo Monday #112 for my Happy Holidays card today. I paired some more fun Making Memories patterned paper with Verve's O Christmas Tree stamp set. Accessories: Circle and Scalloped Circle Nestabilities (Spellbinders), Holly Ribbons embossing folder (Provo Craft), Marker (Copic), Ribbon (Papertrey Ink), Pearl (Prima), Foam tape, Thread, Sewing machine. Love the embossing on the narrow panels. The bows are so pretty! Great paper choices!